Doug Conrad, a former A+ detective in the Akron Police Department but who now owns Conrad Confidential, a nationally recognized detective agency, knows again how it feels to bethe hunted. Quinton Reed, who has sworn to exact the most horrible revenge on Doug Conrad stalks him and his two children once again after the abduction and death of his wife, Cynthia. In a book about evil andinjustice, Quinton Reed stands larger than life, the incarnation of both, and readers are hard put to find a more hated enemy in the history of the crime detection genre. 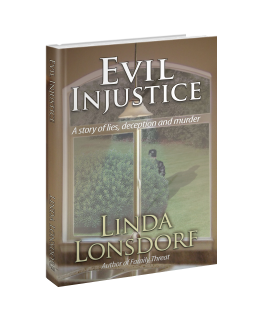 Linda Lonsdorf starts Evil Injustice with action and suspense at full blast and turns up the thrill a notch higher when Bill and Ivy Chandler are murdered execution-style. Lonsdorf knows when and where to strategicallyput the next, arresting development to keep the plot jumping. There is barely a moment of calm or peace in the book and this is its strength. She takes us deep into the heart of the family unit. The characters areall caught up in the game that no one will win, and the author has come up with the formula for at least a half-dozen more of the same mightily gripping stories. The author introduces new characters to the Conrad investigative team who share the same loyalty and character as Doug Conrad and are committed to upholding the integrity of their cases. They are a good fit and will, seemingly,bring laughter and vitality to future books. The author attempts to go beyond the suspense to take the reader into the depths of family dynamics, showing a sharp contrast between the Conrad family and the Darrington family. She begs the question of truth and makes the reader consider how her characters have gone beyond the average human frailties and foibles to an inner evil that lurks inside them to manipulate others and make themcome unglued.